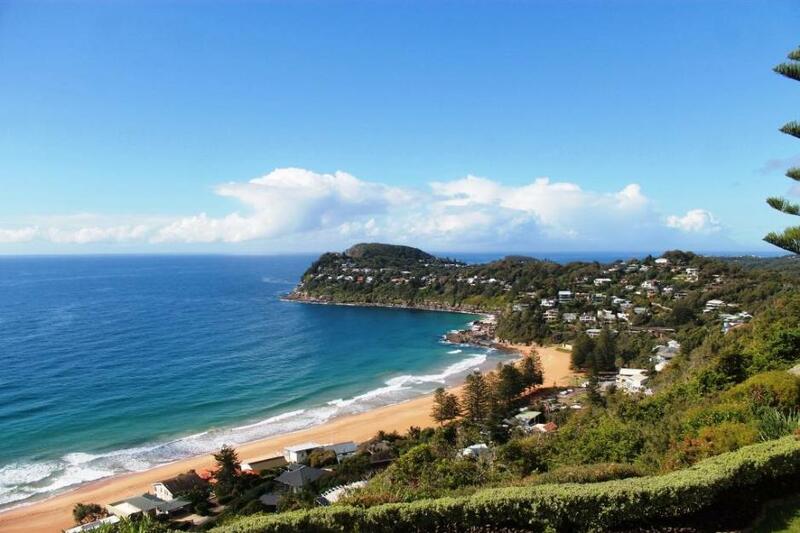 Have A Whale Of A Time Pittwater! Whale Beach on Wednesday April 1st, 2015. Picture by A J Guesdon. Pittwater has had a soggy start to the Easter and School Holidays so we thought we'd share this picture we took earlier this week to cheer you all up with a bit of blue sky dreaming. The sun is sure to return as soon as everyone comes home from their Easter camp sites, or the Blues Festival, and is forecast to be clearing and getting brighter Monday. Meanwhile, native ducks are having a great time in the deepening and widening puddles we've all seen everywhere this week - balance! 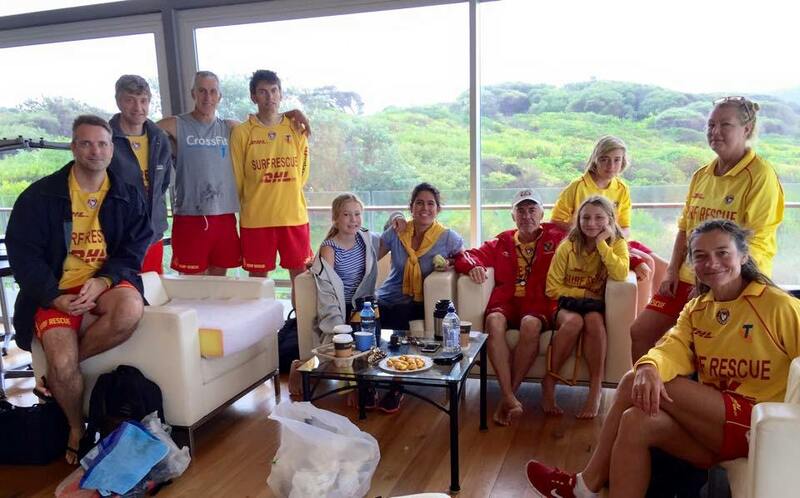 Avalon Beach SLSC Patrol 4 Rescue - Good Friday - 8.30 a.m.
Patrol 4 of Avalon Beach SLSC - photo courtesy Chris Hopton. Fundraising for our Pittwater surf life saving clubs helps maintain vital services. Good Friday’s volunteer patrol gave up their holiday time to keep Avalon Beach safe. Patrol 4 performed a rescue at 8.30am even before being set up after a swimmer was caught in shark alley. Members Brent Williams and Jeff Nesbitt brought a 14 year old who was caught in the rip that runs alongside the pool back into the beach via a rescue tube. Jeff Nesbitt is Director of Junior Activities at the club while Brent Williams is the gentleman who runs Cross Fit Training in the new gym facilities. See www.crossfitavalonbeach.com.au for details. Avalon Beach SLSC is celebrating it’s 90th anniversary next month. All past and present members are asked to join in the celebrations across the first weekend in May which include an historical photographic exhibition on display in the Clubs main hall throughout the weekend. Curated by Avalon Beach SLSC member and President of the Avalon Beach Historical Society, Geoff Searl, the Clubhouse will be open throughout the weekend for anyone to visit and have a look at the exhibition and a definite do not miss event. On Friday May 1st the Club will be hosting a party with a meal and music. Tickets are $35 per head and can now be booked online or by contacting the Avalon Beach SLSC office on Monday, Wednesday and Friday mornings. The Club lounge will open at 5.30pm with a paella dinner, catered by Food Stuff, being served at 7.30pm and speeches at 8.30pm. Music will then be supplied by Matt Farmer’s 5 piece band Groovefarm. As part of celebrations Avalon Beach SLSC is also fundraising for the Club with a special offer of award winning wines from Margaret River in Western Australia. For every dozen sold $40 goes towards the Club. All inquiries can be made by ringing the office on 02 9918 3298 or by emailing avalonbeachslsc@gmail.com for more information. If you would like to book your tickets for the event, purchase some of the best wines in Australia, or see any of the other great range of activities offered to everyone at the club, such as great early morning yoga classes, please visit the Avalon Beach SLSC website for all details at: avalonbeachslsc.com.au and in our Events page. Picnic Against Yamba Development Application on Scotland Island! Protest on Scotland Island last Sunday - picture supplied. 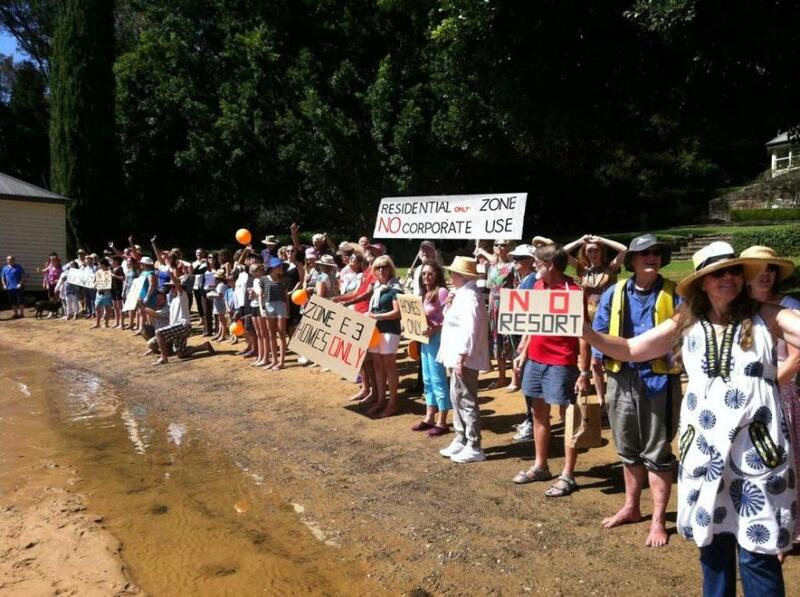 More than 70 Scotland Island residents gathered on the beach last weekend at the iconic Yamba Estate to protest against a highly controversial commercial development on Scotland Island. The proposal claims to be a new dwelling but closer inspection clearly demonstrates its integration with the existing property at Yamba. The resulting 14 bedroom resort, corporate retreat or training facility, as it has been variously described, is to be used for short-term stays by business executives. 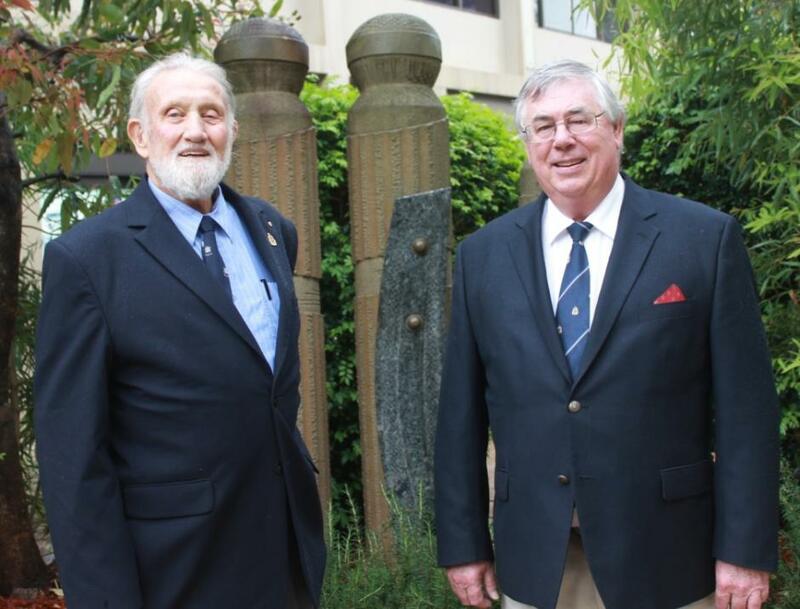 Commodore Graham Sloper AM RAN (Rtd), and President of Avalon RSL Sub-Branch and Bill Hardman, President of Forrestville RSL Sub-Branch - the gentlemen who have worked for four years to put Sunday the 19th of August's WHOLE Community Service together.AJG pic. Fine sunny weather is slated for the historic 2015 Centenary ANZAC Commemoration. Time to Pull Easter Blooming Cassia! 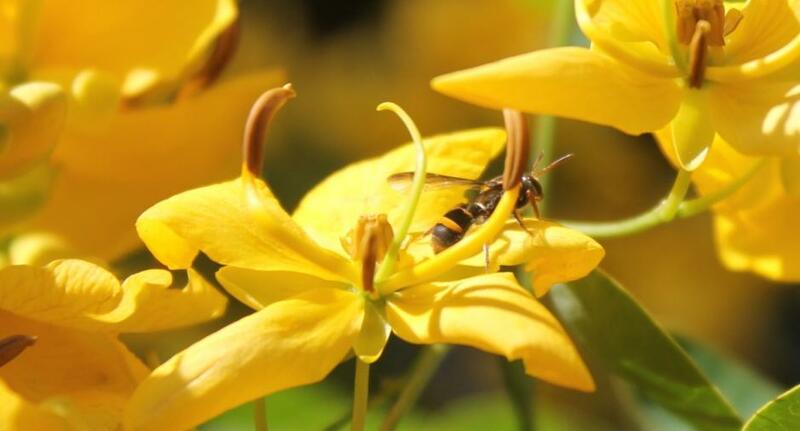 Easter Cassia (Senna pendula) not native, with a native this week - photo by A J Guesdon. This blaze of yellow-flowering bush catching your eye everywhere at present, and originates from South America, which like the equally ubiquitous lantana was brought here by bright sparks who 'liked the flash of colour at this time of year', is a weed strangling our native bushland and all dependent on that resource remaining as it should. It will grow into a tree if you're not careful, will invade other areas and other gardens and will be producing seed pods soon to spread the devastation further. As we have had some decent rain, and the soil is softened by this, reach out while you're strolling past and pull it out...please!